It’s been 20 years since the landmark Mabo High Court Ruling that established the basis for the recognition of Native Title in Australia and to mark the occasion, the ABC screened a new and very moving dramatisation of Eddie Mabo’s ten-year battle to gain ownership of land that his family had been in possession of for sixteen generations. ‘Mabo: a love story’ was directed by Rachel Perkins of Blackfella Films who obviously wanted to focus as much on Mabo’s relationship with his wife Bonita as she did on his historic struggle and it was a wise decision as it gives real heart to the piece. But in the rush to tell this sweeping tale in the allocated 1 hour 45 minutes the details of domestic events are skimmed over. 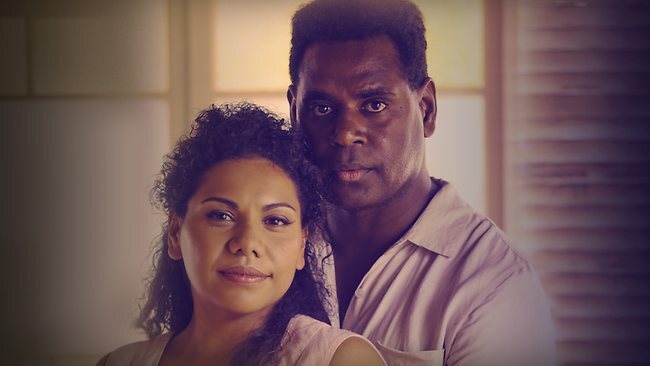 While Eddie (a brilliant Jimi Bani) becomes involved with the union to get a fair go for islanders working on the railway in western Queensland, he meets Bonita (Deborah Mailman) and must overcome his drinking in order to woe her. He dances with his demons on the railway tracks then suddenly they’re married and she’s pregnant with the first of their ten children. It does seem a shame that they didn’t make a longer mini-series out of this material as there’s obviously lots of it to plumb. Still, we do get a vivid sense of what it was like to be black in Queensland in the late 50s and how one extremely persistent man made all the difference. In one scene Eddie props himself up at the end of a country pub with a sign that reads ‘I’m not leaving til I get a drink’. It’s an act of defiance that marks Eddie out as a man prepared to go the distance for what he believes in. The actors also recreate a May Day march blended in with archival footage in which a black man is seen holding a placard stating; ‘We have bugger all’. It’s brilliant stuff and it was this sort of early activism that laid the foundation for Eddie’s lifelong fight, one that famously resulted in the denouncement of the fraudulent concept ‘Terra Nullius’, which had until that time enabled white colonisers to grab land that was not rightfully theirs. In the process of working through the case, we are treated to a parade of be-wigged judges and barristers played by the likes of Colin Friels and Miranda Otto. But it is Eddie who remains the focus of our attention. The weight of such an epic crusade takes a heavy toll on him. He dies five months before the verdict is handed down but Bonita lives to celebrate the victory and in what becomes a real tear-jerker of an ending, we see her driving around the countryside with a hand-painted sign with the simple message; ‘We Won’. With a cracker of a soundtrack that features songs like Jimmy Cliff’s ‘Many Rivers To Cross’ the filmmakers engage us on an emotional level and despite some rushed storytelling in the early part of the film, leave us with a sense that justice has finally been done.